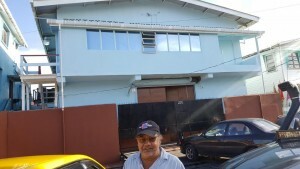 Lawrence “Larry” Singh standing in front of the bond on 29 Sussex Street, Albouystown that he is renting government. Minister of State, Joseph Harmon on Thursday said he had no part to play in informing city businessman Lawrence “Larry” Singh that government needed to rent a pharmaceutical bond. “If I told Mr. Larry Singh? Joseph Harmon? No,” Harmon said when asked by Demerara Waves Online News asked him whether he told Singh that government needed a bond to store drugs for the public health sector. The Minister of State could not say why the cabinet sub-committee did not seek to ascertain how Singh knew that government was in search of such a storage facility. “I can’t say why they didn’t.” Harmon could not say whether government was convinced that the city businessman was not informed about government’s desire for a bond to allow for an advantage. “I cannot pronounce on that. That is a different type of investigation which I have not done,” he said. Neither Public Health Minister, George Norton nor chairman of the Cabinet sub-committee, Raphael Trotman could say how Singh had become aware that government had wanted bond to rent. 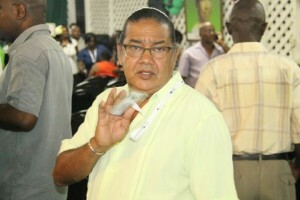 Lawrence “Larry” Singh holding up his PNC-Reform delegate card as he objected to his photograph being taken at that political party’s recently held Biennial Delegates Congress. The Minister of State made known his position at a time when former Auditor General, Anand Goolsarran and a private citizen, Majeed Hussain are threatening to take legal action to quash the transaction between the Ministry of Health and Linden Holdings Inc; a company whose principals include Singh. Singh is a long-time member of the People’s National Congress (PNC) and recently attended the three-day biennial delegates congress of that party. After Singh leased the former Sidewalk Café and Ariantze Hotel on Middle Street, Georgetown following last year’s general elections and transformed it into Midtown Restaurant, the new entity had up to recently been frequented by top government officials most of whom are PNC members. The bond, located at 29 Sussex Street, Albouystown, Georgetown is being rented for GYD$12.5 million, instead of taking up the offer by New Guyana Pharmaceutical Corporation to rent its bond for GYD$19 million monthly. The building was bought by Singh from Desmond Shafiq Mohamed for GYD$25 million on March 4, 2016. Hussain wants to mount a High Court challenge against the deal on grounds that the monthly rent is unreasonable, the premises is unsuitable for a pharmaceutical bond, the Procurement Act has been violated because the contract has been sole-sourced. Singh, currently an arms and ammunition supplier to Guyana’s security sector, was also a key principal in Tropical Airways that had left more than 100 persons stranded here after flights between Georgetown and New York had been halted abruptly and the airline folded.